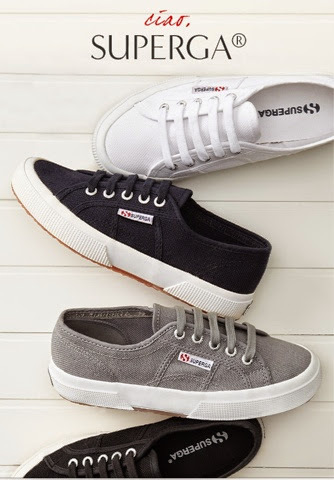 Banana Republic now carries Superga, a sneaker I've been coveting all summer. A colleague has the gray and they are cute as heck on her. The problem might be finding them in stores, however, as according to "Reserve in Store" availability online, there's only a couple colors to be found in Manhattan: size 8 1/2 in gray sage at the 59th and Lexington store, and size 10 in white at the 16th and Fifth Avenue store. But keep checking online or drop by your local Banana Republic for Superga updates. I'll be stalking the 34th Street location. Update: The 34th Street store has the white in size 6. Hey, it's something...click "Reserve It" here.